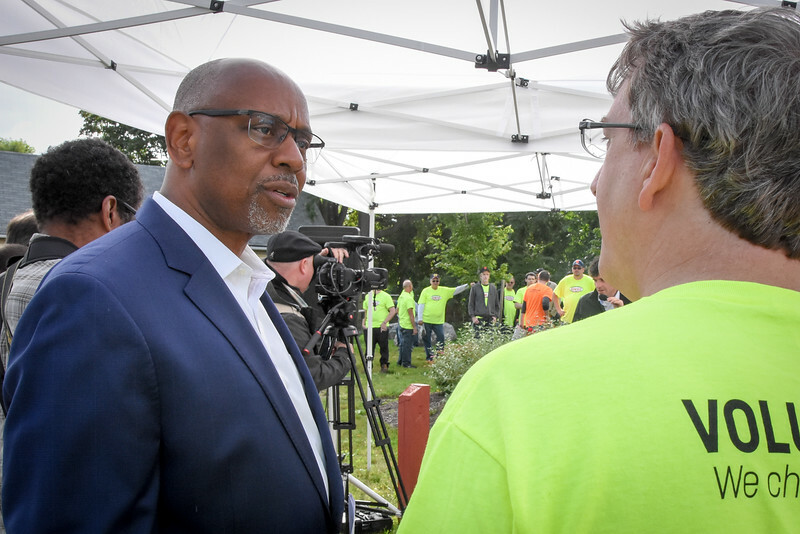 Deputy Mayor Cedric Alexander altered his time cards, three days after Rochester for All filed an open records requests for his official schedule and travel records. The changes added 31 more hours of vacation time, including an out-of-town conference he previously put down as regular hours. Alexander’s official schedule shows he was absent from City Hall 28 days, 21 of them on what appeared to be personal business. Rochester for All filed an additional open requests request for his time cards, payroll records and employment agreements. We wanted to know more about why this arrangement was allowed. The records show Alexander billed taxpayers for all of his out of town conferences, even if the city didn’t pay for his travel. These conferences included National Organization of Black Law Enforcement, Axon, Taser and CIT International. Alexander managed to avoid taking a lot of vacation days by logging more than 8 hours during the days he was at City Hall. But Alexander sometimes struggled to reach 80 hours a pay period. Alexander earns $140,000 a year. We filed a Freedom of Information Law request on October 14 for Alexander’s official schedule. The city filled our request on December 20. We later filed a request for his payroll and time cards, which we obtained February 2. Records indicate someone at City Hall initiated a review of Alexander’s time cards right after our request for his calendar. Alexander’s June trip to Arizona for the Axon/Taser conference was flagged. His time card was 6.5 hours short of 80 hours, but he had been paid for the full amount. Alexander filled out a form to convert the 6.5 hours to vacation time on October 17. Alexander was a featured speaker at the Axon/Taser conference. He admitted on WHAM1180 that he was not paid a speaking fee, but Axon “paid his expenses.” Axon also held a cocktail hour for Alexander, where he promoted his book. This trip appears to violate the city’s ethics code, which prohibited accepting anything worth more than $25 from a city vendor. The review of Alexander’s time cards also flagged the Crisis Intervention Team International Conference in Florida. He was a featured speaker at the August conference. The time card for the pay period was four hours short, but he was paid the full 80 hours. Alexander switched 24 hours on his time card to 24 hours of vacation on October 17. The switch of hours from work to vacation hours suggests the review found Alexander should not have claimed the conference as city-related work. During another week, Alexander’s time card was short .5 hours. Those hours were converted to vacation. The internal review of Alexander’s time cards from April to October indicates he marked 31 hours as work that should have been marked vacation. Most of Alexander’s original time cards were signed by Warren, though he signed a few of his own. Between April 24 and December 22, the dates for which we have full payroll records, Alexander took 97 hours of vacation, or 12 days. That includes the 31 hours of vacation the city added during the October review. Under senior management rules, which we obtained through an open records request, he would have had only seven days in the 2017 calendar year. The rules have no provision for awarding extra vacation time. The city told us via another open records request that Alexander has no individual employment agreement allowing extra days off. A cross-reference of Alexander’s official schedule with his time cards shows he may have included ceremonial duties to reach the 80 hours needed for a full paycheck. Weekend galas, such as Distinguished Gentlemen and Hillside Work Scholarship. Visits to churches on Sundays, which ramped up right before Primary Day, when the mayor was up for reelection. Three hours on July 4, when he introduced the RPO and enjoyed the city’s exclusive open-bar party at the Riverside Convention Center. An evening speech at a public safety conference at Hobart William Smith, a day on which he clocked 10 hours. A July 14 photo shoot for Warren’s campaign, another 10 hour day. Alexander clocked one 14 hour day and another 13 hour day. These longer days were necessary for him to reach the 80 hours for the pay periods. Why did Alexander initially claim the CIT International Conference was work? Why was it switched to a vacation? 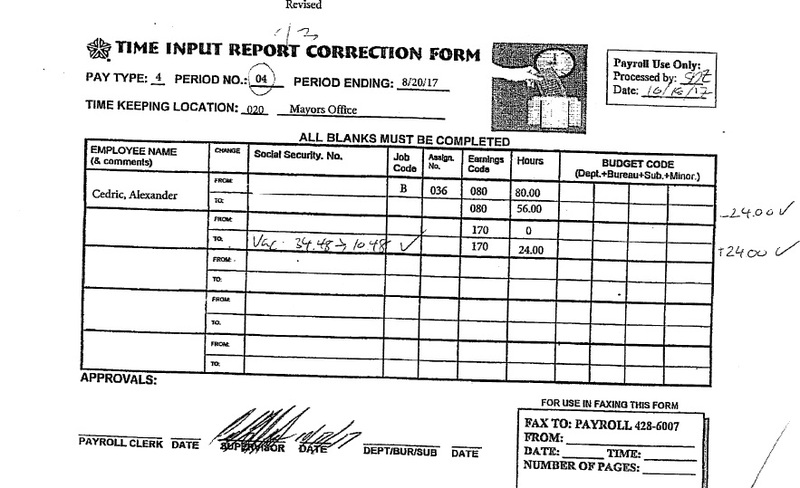 Why did the city only review Alexander’s time cards after our open records request? Why did the city pay Alexander 41 hours of vacation above what he had accrued? Was this an illegal gift of public funds? This is despicable behavior for representing a hand picked position by the mayor of a city trying to gain the respect of those its supposed to serve. It seems as though every unscrutinized moment of paid employment is an opportunity to rip tax payers off for services not rendered by performing the job that is appointed and in the format it is expected to be done. It also seems clear that without feeling threatened by a watchful eye, he is perfectly willing to serve himself and his own ambitions, validating this fact by quickly editing his willful transgressions to cover for those things that were done with deliberate purpose. As a tax payer this is alarming and the next obvious question we would have to ask is what happens to people who do this and are caught. “I’m sorry…” isn’t good enough. Many criminals are often “sorry” if they think it will help their case but they still need to pay for what they did. “Making up for it” by changing your hours to make it right isn’t good enough for knowingly doing something you know is wrong in the first place. Things like this just leave the voting public to wonder about what else goes on with a secret handshake behind closed doors. No wonder nobody believes what our politicians and other elected (hand appointed) officials have to say.